Update: These are no longer being built, but a few are still available for sale. Mark (from MCEV in Seattle) was kind enough to back it out of the garage into the street for me, and show me how to work the door handles. Come on, you think that was easy? The door handles are wee little plastic levers on the side of the door, you lift them up as you pull the handle. Don't worry, it's not as delicately breakable as it looks, they assured me. Oh, and another thing you should know is that the seal is so tight on the door that you gotta roll the window down a bit to close it; very Euro! ZENN Song from a Happy Customer! So...back to my day at the dealership! After Mark showed me the "forward" and "backward" lever next to the steering wheel, pointed to the "17 miles" left on the state-of-charge meter and advised me not to try and drive it all the way to Portland or something - I was outta there! Some alarm bell kept going off. Not the sweet silence I'd been hoping for, let me tell you. 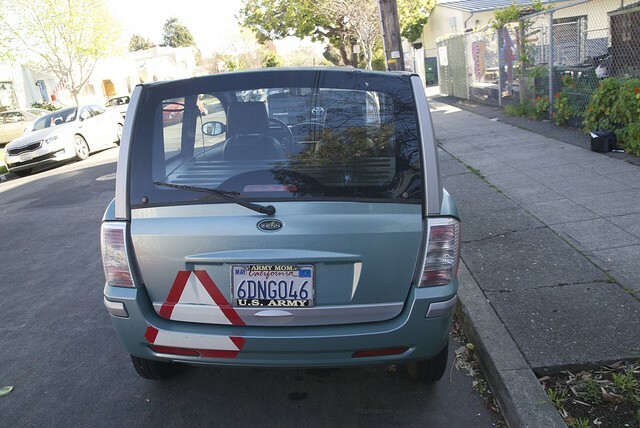 In fact, at some point (backing up to turn around) there were actually TWO warning bells going off at the same time. Aaahh!!! What am I doing wrong? It took me two blocks to figure out that I hadn't released the parking brake all the way to the floor (it's in the console, below the "gearshift". I thought I had, but "close enough" doesn't cut it in a ZENN. Take it from me: it has to be ALL the way to the floor. Oh, and that's how I found out there's a backup warning alarm that comes standard. Seems kinda silly. I mean. Does a HUMMER have a back-up alarm? Anyway, seems like a Hummer could USE a back-up horn. A ZENN on the other hand is little and has LOTS of windows and is not likely to harbor a blind spot. Still, with little kids around, there's no such thing as "too safe", is there? Gavin didn't get to test ride the ZENN electric car with Momma. 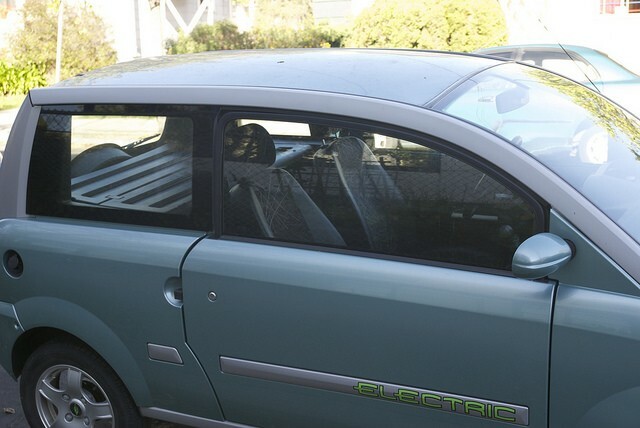 They are designed to seat two people, and there's room for stuff in the back, but we didn't like the idea of putting the child seat in the front, and there wasn't a place in the back to latch it down. So he stayed in the dealer's office while I took it out for a ride. He did get to look that little ZENN over that was in the showroom, though. He liked the sea-green one best, and I think I'd have to agree with that. Good call, Gav. The construction is a lot lighter and more plastic-intensive than we're used to seeing in America, but it's obviously a regular production car, which will make some of us feel more comfortable. There's a set of batteries in the front, under the hood, and another set in the back under the floorboard. There's a release mechanism from the driver's seat to get to the battery compartments. The buttons and knobs and wheel and pedals are just where you'd expect them to be...the seatbelt is normal, the seat and mirror adjustment is normal. That ZENN electric car started out its life as an ordinary car in France, after all. It's actually a conversion! The ZENN Electric Car is not sluggish! 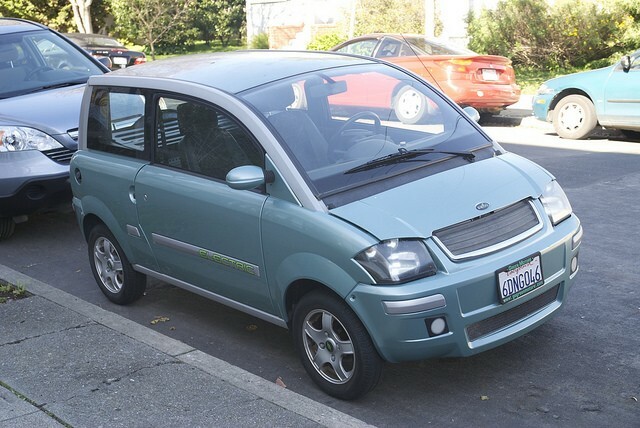 Driving a ZENN, you could easily forget you were in a neighborhood electric car...the SLOW electric car, right? Ha. The acceleration is AWESOME. The handling is awesome. The look is awesome. I made it back to the dealership with no new dents. ...and as a solid fan of the ZENN electric car! I'd happily own one, and I think they're well worth the money. Back to Neighborhood Electric Cars.